Americans eat 31.4 lbs. of cheese each year and 600.5 lbs. of non-cheese dairy products. They drink 181 lbs. of beverage milks. Americans eat 192.3 lbs. of flour and cereal products, including 134.1 lbs. of wheat flour. They eat 141.6 lbs. of caloric sweeteners, including 42 lbs. of corn syrup. Americans consume 56 lbs. of corn each year and eat 415.4 lbs. of vegetables. Every year, Americans eat 24 lbs. of coffee, cocoa and nuts. Americans eat 273.2 lbs. of fruit each year. These foods include 29 lbs. of French fries, 23 lbs. of pizza and 24 lbs. of ice cream. 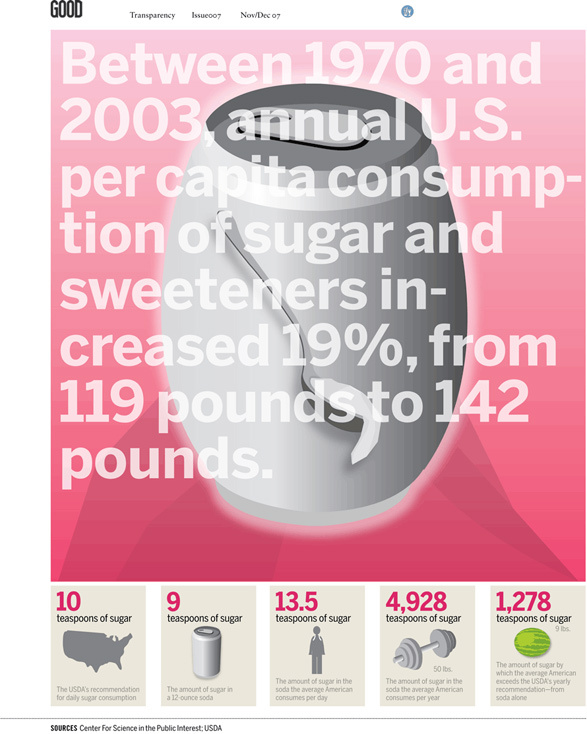 Americans drink 53 gallons of soda each year, averaging about one gallon each week. Americanseat 24 lbs. of artificial sweeteners each year. They eat 2.736 lbs. of sodium, which is 47 percent more than recommended. 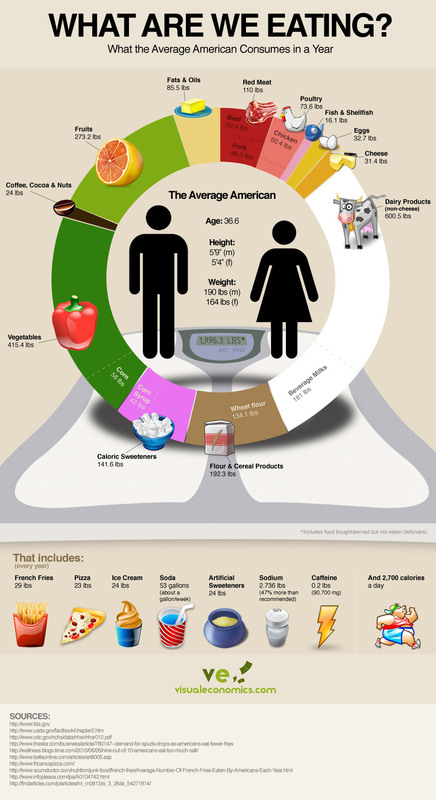 Americans consume 0.2 lbs. of caffeine each year, about 90,700 mg. In total, Americans eat an average of 2,700 calories each day. “Iowa State University researchers are putting flu vaccines into the genetic makeup of corn, which may someday allow pigs and humans to get a flu vaccination simply by eating corn or corn products. Filed in Chew on this, Genetic engineering, Keep your eyes open! Between 2003 and 2007, the FDA’s main food-safety arm lost 20 percent of its science staff and 600 inspectors. The United States gets 15 percent of its food from foreign countries, including 60 percent of its fresh fruits and vegetables and 75 percent of its seafood, but just 1 percent of all imported food is inspected. The CDC estimates that each year 76 million Americans get food poisoning, more than 300,000 are sick enough to be hospitalized and 5,000 die. More than 200 known diseases are transmitted through food . The causes of foodborne illness include viruses, bacteria, parasites, toxins, metals, and prions, and the symptoms of foodborne illness range from mild gastroenteritis to life-threatening neurologic, hepatic, and renal syndromes. Some proportion of foodborne illness is caused by pathogens or agents that have not yet been identified and thus cannot be diagnosed. The number of farmers markets in the United States continues to grow, reports USDA’s Agricultural Marketing Service (AMS), reaching a total of 4,685 in August 2008. This represents a 6.8 percent increase since mid-August 2006, when AMS reported 4,385 farmers markets nationwide.